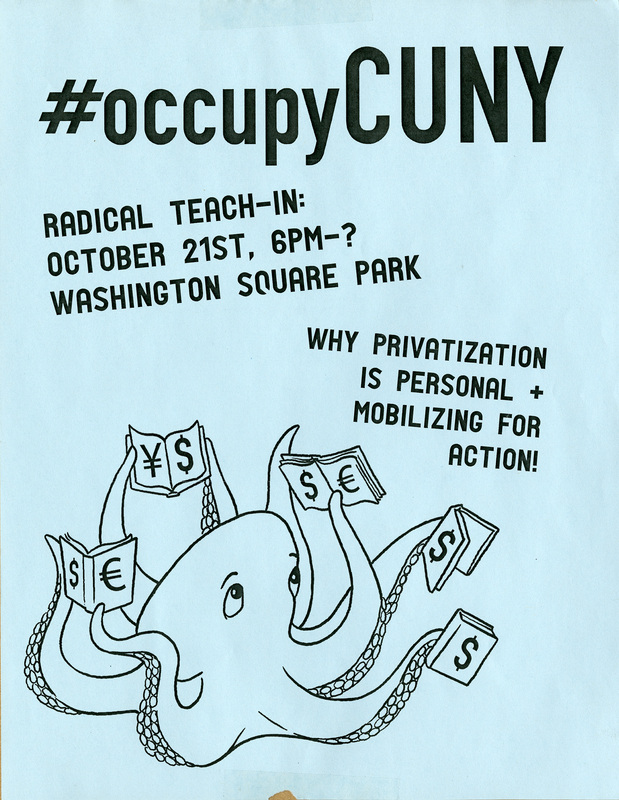 This flyer announces a radical-teach by CUNY Graduate Center students on October 21, 2011, in Washington Square Park. An offshoot of the Occupy Wall Street movement, Occupy CUNY organized around fighting the militarization of CUNY campuses, and the privatization of education. CUNY students collectively organized pop-up universities, direct action teach-ins, hacking spaces and general assemblies at the Graduate Center and in public spaces. Occupy CUNY also stood in solidarity with Cooper Union students against the implementation of tuition and Quebec’s student movement. Rights | Copyright Occupy CUNY This work is licensed under a Creative Commons Attribution-NonCommercial-ShareAlike 4.0 International License. Cite This document | Occupy CUNY, “Radical Teach In,” CUNY Digital History Archive, accessed April 19, 2019, http://cdha.cuny.edu/items/show/6502.